Have you heard about Veganuary? Taking place during the first month of the year, it’s where people pledge to follow a vegan diet for 31 days. Veganism – where people refrain from using or consuming any products derived from animals, including meat, dairy products and leather – is becoming increasingly popular, and it’s estimated that there are as many as 3.5 million vegans in the UK. 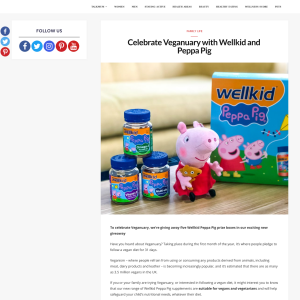 If you or your family are trying Veganuary, or interested in following a vegan diet, it might interest you to know that our new range of Wellkid Peppa Pig supplements are suitable for vegans and vegetarians and will help safeguard your child’s nutritional needs, whatever their diet. We’re giving away five Wellkid Peppa Pig prize boxes to followers of TalkMum. Each box contains one pack each of Wellkid Peppa Pig multi-vits, Wellkid Peppa Pig Omega 3 and Wellkid Peppa Pig Vitamin D along with a soft Peppa Pig plush toy any fans of the character are sure to love. Use the Rafflecopter widget below to let us know the name of one of the varieties of Wellkid Peppa Pig supplements. The five winners will be picked at random from all correct entries received by the closing date of 11.59 on Sunday 3rd February 2019.